I know a good ticket when I see one and this ticket was a deal. 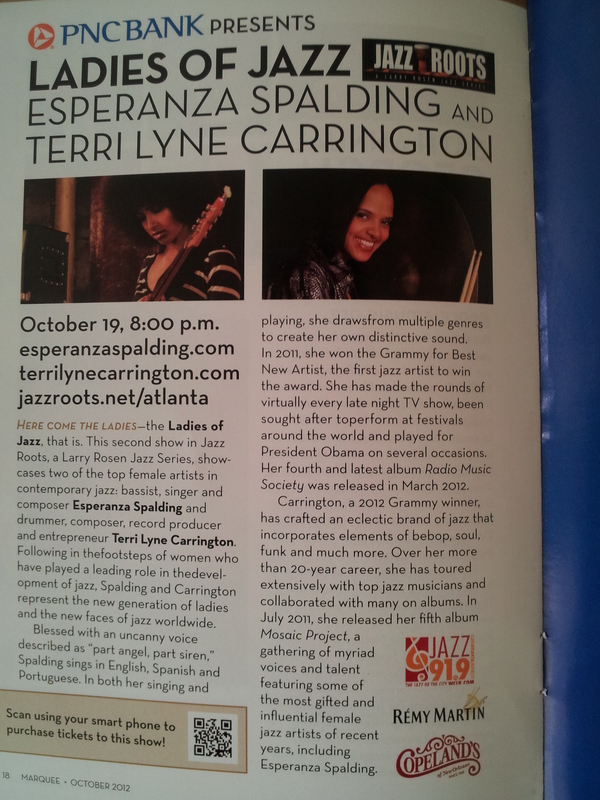 For $40 + all those ridiculous surcharges, on Friday night October 19, the old broad headed to Cobb Energy Performing Arts Center for the Ladies of Jazz show featuring Terri Lyne Carrington and Esperanza Spalding. Last time I went to the Center was four years ago. Having been open only a few months at the time, it was a sparkling facility and it’s just as sparkling now as it was then. The ushers were very friendly and helpful, the bathrooms and common areas were spotless. Upon being seated in the auditorium the crowd seemed to be fairly light. Which was unusual because for a Friday evening, there were no traffic snarls on the way to the venue. Little did I know that there would indeed be a full house. People were just late and not even fashionably late but rudely late. Many arriving halfway through the first artist’s set. Atlanta music patrons, please get it together. The artists deserve better than that. 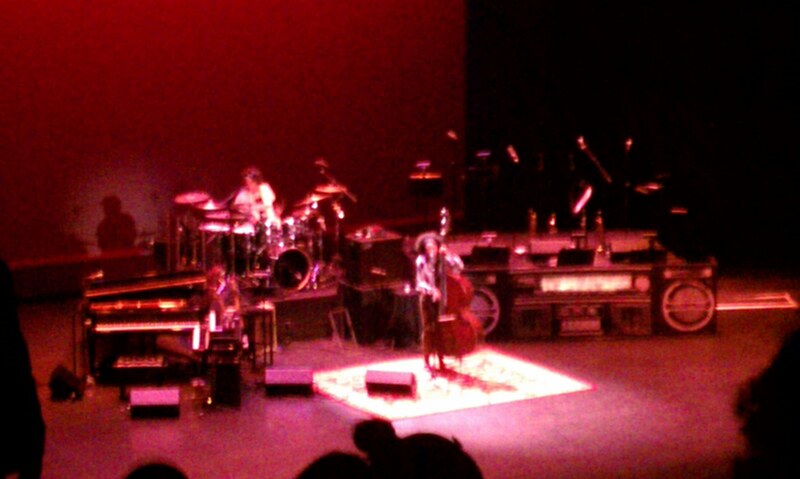 Drummer, Terri Lyne Carrington and her band opened the show. Her set was short, too short for me which amount to about seven songs some of which were from her most recent release Mosaic. I’d only recently discovered her music after watching a YouTube video with footage from some of the Mosaic recording sessions and finally purchased Mosaic a few weeks ago. Carrington opened her set with “Triad” (from Mosaic) which is a burner. Her band consisted of guitar, acoustic bass, trumpet and saxophone. Moving quickly through her set, other standouts tunes included the third cut “Hopscotch” followed by a cut entitled “Sweden” which she said was inspired buy a recent tour date there. The finale which I cannot name opened with an outstanding drum solo, which from what I hard and saw, makes me really dig her playing, which is her efficiency. There’s no wasted energy, no theatrics, flying drumsticks, sweaty brow and such. Carrington takes command of her kit like a bawse! I’ve heard many a drum solo in my day and have watched drummers play as if they’re trying to kill their kit no such thing with Carrington. She commands while being understated and it works. Upon hearing Carrington live and reading up on her I regret being late to the party. From this show, I’d say she’s a musician first and a performer second. There’s no doubt that more of Terri Lynne Carrington’s music will be added to my library and hopefully additional opportunities to hear her live. 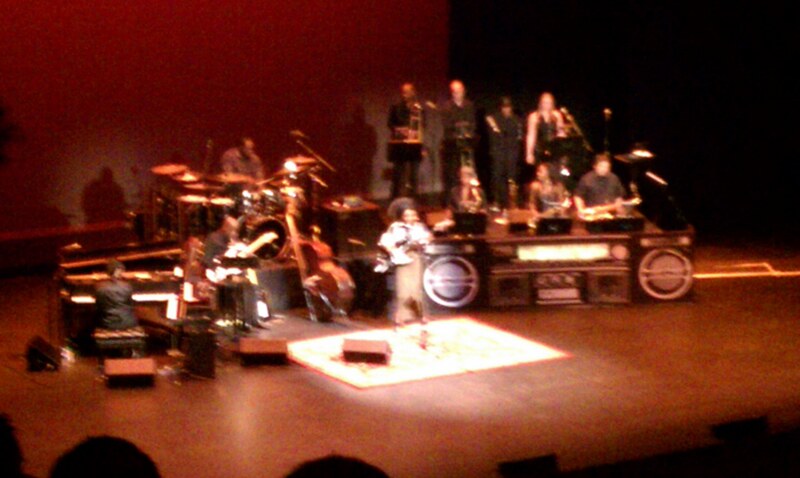 Turns out that the auditorium was full for the second set when bassist/vocalist Esperanza Spalding hit the stage. I first heard Spalding via @Fave and his former podcast show Friday Favecast. She was all the hype at the time and won a best new artist Grammy in 2011. Though I’m not a music journalist, I am a bit of a music snob and when I hear hype or what I perceive as hype I steer clear. Fast forward to 2012 and he release of Spalding’s Radio Music Society. I “caved” copped it and loved it. She has a sweet vocal and in my ear I hear shades of two important vocalists, Michael Franks and Minnie Ripperton. Divergent, a bit, but to me she references them both in delivery and tone but let’s be clear it’s not just Spalding’s vocals that garner attention, she gets down on the bass, acoustic and electric. City of Roses – Spalding entered the stage on electric bass, the crowd was bananas and there were catcalls from my section (fans please get it together, this isn’t appropriate). She introduced her entire band which included, piano/keyboards, three saxophonists, two trombonists, two trumpeters (the female trumpeter was also a vocalist) a male vocalist, drummer and guitarist. Hold On Me – Spalding simmered on this. Nice range and beautiful clear tone. She nailed this. I Can’t Help It – MJ would have been pleased with this rendition. Black Gold – The intro featured the male vocalist who referenced Trayvon Martin. The intro nearly brought me two tears for both the vocal and the content. Algebra Blessett joined Spalding for the remainder of the song. Endangered Species – the entire band went hard on this one, male trumpeters solo was excellent. Encore – I’m not sure of the name of the tune but Spalding played acoustic bass accompanied by Terri Lyne Carrington on drums. Brief but nice with a stripped down sound and feel. I can honestly say that I’m now a believer. For me the true test is always how a musician comes across live and quite frankly she nailed it. She has the musical and performance chops and is really engaging. Her band was excellent and didn’t miss a beat. Spalding definitely has the chops and will hopefully be around a long time to bless us with her talent. I’d certainly see her again. If you caught the Atlanta Ladies of Jazz show or have heard these artists live in your town. I’d love to hear your thoughts, please feel free to do so in the comments.